Whatever happened to the good old-fashioned American suburb? Quiet elm-lined streets, sidewalk chalk, catching up with neighbors on the front porch, kids playing together unsupervised? Who outside the city walks to a corner store anymore? Or knocks on doors looking for a cup of sugar? Americans are building larger houses and moving farther from their workplaces. This trend not only consumes resources but also affects our quality of life. We work longer hours and have longer commutes… and our relationships are increasingly conducted by phone and email and Instagram rather than in person. The result is that we tuck into our houses at the end of the day with no desire or need to go outside, and the concept of the neighborhood is lost. Happily, some visionary planners have a great idea to bring that old model back. 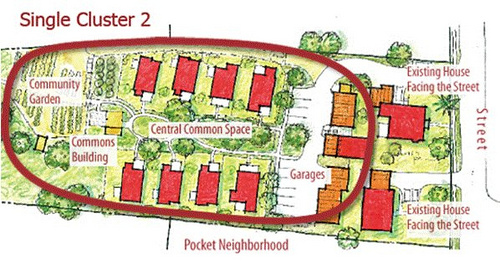 A pocket neighborhood is a cluster of houses built around a central courtyard that can serve as a community garden and gathering place. They tend to be compact, with parking only on the perimeter to keep the interiors safe and clean. The houses themselves aren’t super big, because the goal is encouraging residents to extend their living space into the public areas. Shared function rooms, food storage, and laundry facilities might make up for the smaller personal spaces. Houses can be “nested” to create privacy without the use of fences or large voids. As a form of infill architecture, they save big on energy and natural resources by clustering population, which reduces land and travel needs. Pocket neighborhoods face legal hurdles – the housing density may require they be zoned as trailer parks, and nobody wants to approve a trailer park – as well as practical issues with a longer walk to the car. They’re easiest to establish in progressive locations with a mild climate, though they can certainly work in places with a harsh winter, such as this four-family neighborhood in Ithaca, New York. My favorite example is the Ross Chapin Architects-designed Third Street Cottages in Langley, Washington, which showcases a wonderful combination of small-house architecture and intentional community planning. If you yearn for the suburbs of yesteryear, maybe you’ll be the one to found a pocket neighborhood in your town!